John Mayer and Frank Ocean are far from strangers. After joining forces to collaborate for Ocean's 2012 debut, channel ORANGE on which Mayer provided guitar work on singles "Pyramids" and "White", the two reconnect as Frank Ocean returns the favor with aiding Mayer on his upcoming album, Paradise Valley. The album's opening song, "Wildfire" features the Odd Future crooner supplying prominent vocals on Mayer's stripped down and beautifully mellow interlude. Not to be mistaken for Mayer's second single of the same name released in July, the mentioned track will serve as the album's opening intro. The follow-up to his 2012, Born and Raised, Paradise Valley will be Mayer's sixth studio album with expectations leaning towards the album being in a similar vein as he previous release. Preceded by the single "Wildfire"and the Katy Perry assisted lead single "Who You Love", Ocean and Perry's appearances mark the album's only features. 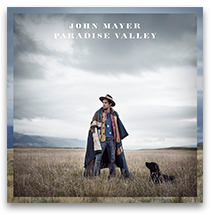 As Mayer continues his 40-stop U.S Born and Raised tour, Paradise Valley is slated for release August 20 and currently available to be streamed in its entirey exclusively via itunes.